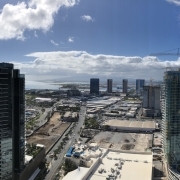 Excitement abounds as the skyline Honolulu’s Kaka’ako neighborhood rapidly changes. 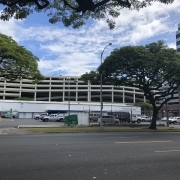 Howard Hughes’ first crown jewel, Waiea Condo, will be completed in November 2016. The condominium building already has a dramatic undulating glass facade. The interior of each unit is taking shape. After touring unit 5A which has been completed, it is clear that the quality is nothing like we have seen in Hawaii. Each unit is spacious in design with 9.6’ or more ceiling height and wide generous hallways. The appointments in each unit which including Miele appliances, motorized window shades, and Toto toilets say a great deal. However, even the small details are carefully handled with finely finished floor molding, precise tiling work, and installed closet organizers. These features combined with all of the building amenities make this new condominium truly unique. 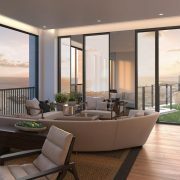 The Waimea condominium is the first building to be completed in Ward Village and new LEED neighborhood in Kakaako by developer Howard Hughes. They plan to build approximately 22 new condominiums! The Waiea is the first, followed by Aeo and Gateway Towers and reserve housing component Ke Kilohana. Beyond the new condos, they are redesigning the streets, landscaping and retail space. Gateway Park will be a one acre park, designed by Richard Meier, in the middle of this new community. Furthermore, Howard Hughes is also redesigning the adjacent Kewalo Basin harbor. The new redesign will have more slips and shops and restaurants. Every part will be redesigned with the whole community in mind to create a masterpiece of a LEED designed community.